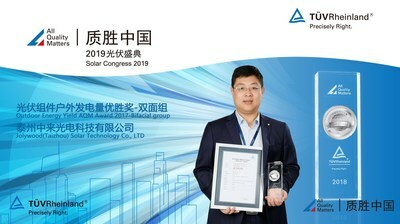 SUZHOU, China, April 1, 2019 /PRNewswire/ - Jolywood (Suzhou) Sunwatt Co. Ltd. (Jolywood) has won TUV Rheinland's All Quality Matters Award in the Outdoor Energy Yield's Bifacial PV Module category with its pioneering N-type high-efficiency PV techniques. The All Quality Matters Award, hosted by global industry leader TUV Rheinland, is an annual celebration of the outstanding contributions from manufacturers of PV modules, inverters, energy storage systems and components in Greater China, and has become a well-known barometer of trends in the PV industry. This year's award ceremony was held in Suzhou, east China's Jiangsu Province as part of the All Quality Matters Solar Congress. During the two-day event, Dr. Liu Zhifeng, GM of Jolywood (Taizhou) Solar Technology Co. Ltd, gave a speech on Jolywood's N-type passivating-contact bifacial module techniques. To assure high quality, all Jolywood products must go through multiple outdoor trials before being approved. The All Quality Matters Award Committee acknowledged Jolywood after a year-long series of on-the-spot inspections of the module's outdoor energy yield, once again demonstrating Jolywood's persistence in excellent quality. "As a dedicated pioneer in the green energy industry, Jolywood has always been sticking to its high-quality standards and strict research and development principles," said Chairman of Jolywood Lin Jianwei. "For over a decade, we have prioritized quality over everything, wholeheartedly devoting ourselves to the development of high-efficiency solar cells, high-quality PV backsheet and high-reliability encapsulating techniques. We hope to be a main force in the pursuit of the coming realization of grid parity."